Fences have been mended in Guimaras. A family dispute that started last October and prompted our move to a subdivision outside of Iloilo City, has ended. My asawa, twin nieces and myself, along with my new American expat friend Scott B, headed out from Parola Dock in Iloilo this past Friday morning to make the pump boat ride to my asawa’s home on the sweet mango province. Thanks to generous donations from Scott H, Charles S, Jason B, and Kenny P, we had a supply of vitamins and school supplies to deliver to our niece, JalAmiel and her brother Jorreal. 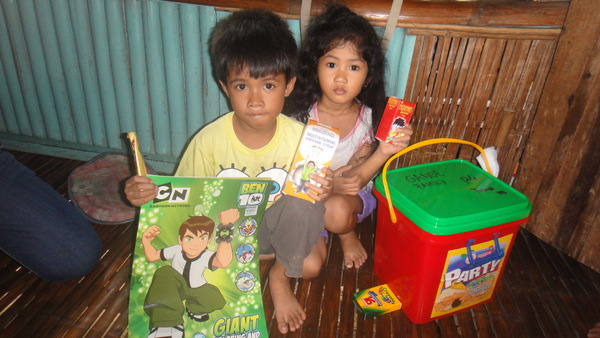 We also had even cash raised to pay for books for the two at a cost of P2,000. Now P2,000 or 47 USD, for books might not sound like that much money, but I can assure that to many people in the Philippines, it is. With four extra mouths to feed at our home, we didn’t have any extra cash to spare. The donations were a lifesaver. Walked from the jeepney stop in San Miguel to our former home, “The Compound.” Saw my my mother-in-law out front, told her I was sorry, and gave her a hug. She smiled at me and planted a kiss on my cheek. Shook hands with my brother-in-law, Joery, who was standing nearby. My sister-in-law, Alida, was in the back getting ready to teach her second class of the day. 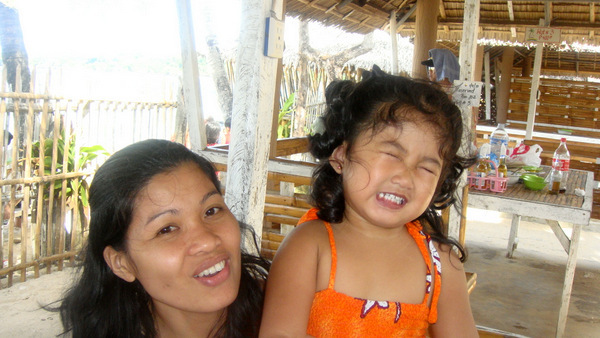 Our niece, JalAmiel, age four, was in her nipa hut, having finished with her schooling for the day. I looked inside and said “hi” and gave her the school supplies. She did not even smile. The little one always used to carry a big smile on her face. She was always so full of life and quite the little character (see next photo.) Now, however, an air of sadness seemed to surround her. Scott and I walked into the back of our home where my brother-in-law Joery had built a one-room classroom. Alida announced that the class had visitors. I approached my sister-in-law and apologized for the my part in the misunderstanding back in October. As I stood before my sister-in-law with tears in my eyes, and my back to the students and Scott, she said it was OK. She soon became misty-eyed, also. Thankfully, the class had not started yet as I brushed aside the tears coming down my face before anyone could see them. Walked back to the front. Advised my asawa that Scott and I were going to Lisa’s Talabahan and asked her to please text the “TomCat” and LenLen to meet us there. My spouse and our twin nieces would catch up with us later since my wife loves the smoked oysters at Lisa’s. I like the cheap beer and grilled pork on a stick. I said good-bye to JalAmiel for now (brother Jorreal was in the “big school” now in downtown San Miguel.) I gave her a hundred peso note to buy some snacks with. She waved good-bye but still no smile. Sounds like everything went well and was a “mission accomplished!” Did you ever figure out what happened to JalAmiel’s missing smile? JalAmiel is probably confused, Randy. She was told for the past several months that “Uncle Dave” is not to be spoken to, I was akin to the “Son of Satan.” I think it will just take time for her smile to return. Give it time and that smile of hers is going to return bigger and brighter. Can’t wait to see what those good catholic ladies had to share with you fellas, I’m guessing a few passages from the bible? It always strike me that your articles are light and happy, but this one is real heavy for me. What happened with your wife’s family in Guimaras? What was the conflict all about? I missed that article Dave and it was a sad day. But for any consolation, that is really is what’s happening to most Filipino family. Just like your wife, I’m an OFW too and every now and then we have that kind of thing going on in the family. Being an OFW, I’m sure you understand the situation, Jonathan. Just glad that that the feud is over, and that we can visit our nieces and nephew again. So Dave, does this mean you will be paying support again for your mother-in-law, sister-in-law, etc? So does this mean you’re going back to guimaras and settle there? No, Kaltehitze, we’ll be staying in Iloilo. I asked my asawa the same question. She said absolutely not. She does not care for the almost daily parade of relatives that used to drop by. She also enjoys the much bigger shopping venues available in Iloilo. We love Iloilo. Still looking around for a lot, but we really like the subdivision we’re at now. If you and your wife like living in Iloilo just think how much better life would be in Davao City or Tagum City. My wife Meriam lived in Iloilo for 4 years. She sure liked the people there (most of them VERY poor.) Would she want to live there? NO WAY! She still thinks Tagum City is the best place to live and she has worked and lived from Manila to Davao City. BTW – I got up early yesterday, took a shower while Meriam was still sleeping. When I was done I woke her and asked her to find me some outside clothes to wear. “Why?” she asked. I told her that while I was taking a shower all I could think about was chicken McNuggets. Not only did she get me something to wear but got dressed herself. Out the door at 3:30 AM and we walked to McDo’s. We had a fun time!!! Got back home a little bit after 5:00 am. Now that is a great way to start a Sunday morning! Life is swell here in Tagum City. Probably will stay around in this area, Gary. We fit in with the poor people, and the relatives are not stopping by to visit us at our new location. But we still are close enough, only two jeepney rides, one pump boat ride and another jeepney and trike ride away. My new expat friend, Scott B, lived in Dipolog City in Mindanao for awhile, but enjoys life in Iloilo now. He’s only a young whippersnapper at 51, and I’m glad he’s made the journey to Iloilo. Different strokes for different folks, Gary. Yep, you’re right, Randy, family is very important. We’re glad to have the nieces and nephew with us again. I have to admit, though, that 13-year-old nephew Sherwin is not living up to Tito Dave’s garbage detail he is assigned to. I just can’t get him to empty a full garbage wastebasket without telling him to do so. My asawa used to buy fortified milk and vitamins for JalAmiel, PapaDuck. We delivered the new vitamin supply now and the little one and her brother and sister are going to join us for the weekend. We’re looking forward to the kids’ visit. They’ve never seen such a subdivision that we live in and there are lots of parks and playgrounds they can enjoy during their weekend visit. We have no children of our own, but always looked upon JalAmiel as our special charge. It’s good to have this whole feud behind us. “just think how much better life would be in Davao City or Tagum City.” – ???? C’mon mate, there’s no need to push down another city as a way to promote your own. Besides, for us to be able to state that conclusion, one needs to have stayed in both cities for a significant period of time. If you notice it mate, nobody here in dave’s site who pushes down other localities even though most readers here may believe that their current locality is the best place to be. As a native of iloilo, I really feel that my place is a very nice city and province to live in. However, that doesn’t mean I can compare others unfavourably, especially when I haven’t been to your place, Tagum city. If Tagum city floats your boat mate, then, that’s good. There’s no need to ram your boat against ours though. Instead, why not row alongside with us? Thanks for your input, Kaltehitze. Oh yeah? Awesome! Looks like word is gonna spread around the expat community in iloilo then. There’s also another place i would want to bring you too. They’re not specialists in burgers though. Rather, they offer texan cuisine. And they serve burgers, texan style (supposedly). So, im expecting some texas sized and texas flavored brugers. I hope they dont dissapoint. You interested dave? Thats true. However, the are nuances among the cities that differentiate one from another. For as long as a city does not turn out be like metro manila in the future, then thats ok with me. Whew! I’ve got to tell you, Kaltehitze, Metro Manila is not for me. Give me life in the province any day! Get away from McDo’s???? That just isn’t going to happen. Fast food is a way of life here. Never see any road kill around here, Gary. I think it must be scooped up rather quickly. Lots of hungry folks around. My gf’s family lives in Tagum City and she recently moved back in with her parents. I hear it is a really nice small city. But isn’t the standard mantra that you shouldn’t live too close to the family? So maybe I shouldn’t fall in love with Tagum. Dave W., the problem with Guimaras, where my wife has a house and lot, was that it was too small. Only around 130,000 people across the whole island. Relatives would stop by every other day looking to sell something or looking for a “loan.” I firmly believe in the “three-hour-rule,” stay at least 3 hours away from the relatives. Some guys even believe in the “30-hour-rule.” I can relate. In our new location in Iloilo we are only about two hours away but haven’t had a problem with any relatives coming to visit. The subdivision is well-guarded and has numerous enclaves. The only relative that has visited is the Tom Cat’s gf, Len Len. And she used to work in the subdivision as a caretaker. She stopped working last year and went back to Guimaras. Came back for a few days to fill in. Her elderly charge passed away during her watch. Don’t know how often she’ll by stopping by anymore. I casually mentioned to my gf last night that I had a couple “online friends” who really like Tagum. I asked her if she did and she said “yes and no”. Sounds like she preferred a place with more to do (she worked in Davao recently) and said there were no movie theaters. Is it really the case that a city that size has no movie theaters? Maybe she just meant her neighborhood. And of course maybe she hopes not to live too close to the family in the future. It is true DaveW – Not one movie house. BUT, the new GMall is building one. Was told it will be done 2013. We even have KFC now. The new mall will have our 2nd McDo’s and 5th Jollibee’s. SM is buying land to build a new mall also. How do you guys get around in Tagum City, Gary? You walk everwhere? I ride the jeepneys in Iloilo all the time. Love ’em. Gary, a while back didn’t you say it rains all the time in Tagum City or something else negative about the weather? Yeah, too much rain here in the winter, I’m trying to get away from it. That’s why I am thinking of Dumaguete every winter and summers in Canada. Why doesn’t your wife want to live in Dumaguete? I recall you said previously that she really liked the people in Dumaguete. Lance, I think you have a great plan. Meriam has lived and worked all over the Philippines. She likes Tagum City the best. She was born and raised in Bukidnon but there isn’t a lot there. 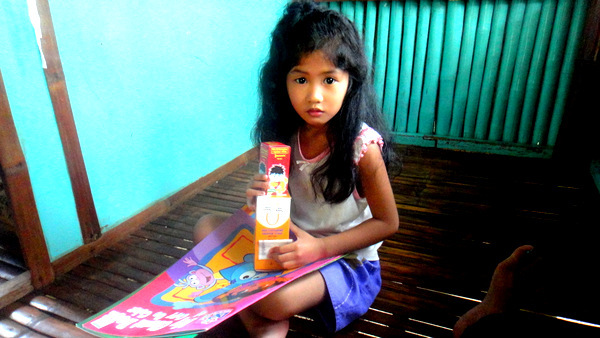 Her mom and dad now live in CDO but are thinking of moving back to Bukidnon as CDO is being taken over by gangs. 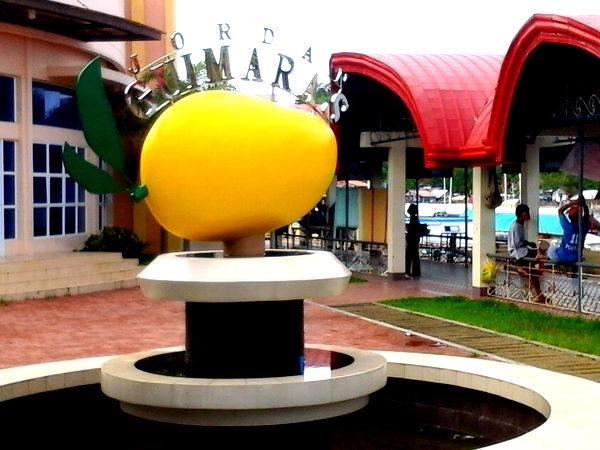 Number 2 on Meriam’s list of great places to live in the Philippines is General Santos City. I have been there a couple of times and it is really nice. Most of the time expats live where the wife or girlfriend wants to live. Most of the time that is close to her family. Meriam’s family lives a good 8 to 10 hour bus ride from here. 🙂 No kidding they are great people. Her dad came down for a visit not long ago. He is a super guy! He didn’t stay long, missing his wife. She is blind but so sweet to me. Sorry to hear about that gang situation in CDO, Gary. I believe the illustrious Tom Ramberg lives in Gen San. I think the women there, however, have some sort of eyesight issue 😯 because I recall they have given Tom “wolf whistles” in the past. I like my father-in-law. Melinda goes out to his home on the edge of the jungle in Guimaras every other month to bring him groceries. Things are fine with my mother-in-law and other close family members in Guimaras. The kids from Guimaras are staying with us this weekend. Always more fun in the Philippines. We have Tricycles Dave. They hold up to 6 people and everyone sits inside. 9 pesos and they will take you anywhere in town. Sorta like Dial A Ride. It’s unbelievable what they can pack on a trike, Gary. Absolutely amazing! I believe you, Randy. Can you see a vehicle like that going down the road in the States? No cop here is going to stop a motorcycle loaded with dead chickens, bamboo or people. Hi Randy…we have those trikes also but they are used to carry cargo of some sort. They even have reverse! How do you get around, John Jackson? We’d be lost without our jeepneys in Iloilo and trikes in Guimaras. Ok, John Jackson, I got it. The jeepneys in Iloilo are only supposed to stop in designated unload/loading areas, but if no one from LTO is around, they stop wherever they want. The pedi-cabs clog up our main roadways as I don’t see many trikes in Iloilo as opposed to Guimaras where we used to live. We call them trikes, too, Randy. Used to ride around them all the time in Guimaras. Here in Mindanao tricycles have 3 wheels Randy. Not sure what you have there. I’ve already described what we have for transportation in our area Gary. You haven’t read all the posts and comments in this thread obviously. I’m not sure about your description of a tricycle as it differs from a motorela, which is common in northern Mindanao. The motorela is somewhat a cross between a jeepney and a tuktuk. It is literally a motorcycle that is encased in a carriage with 2 rows of seats facing each other. The Philippine version uses the motorcycle rear wheel as the drive wheel with the carriage, or cab, mounted on a two wheel rear axle. See the photo in my Part Two post. This is not a tricycle! Or, you can Google ‘Philippine Motorela’ for more info. Here’s the link to that story with the pic, Randy. Thanks for sharing that info. I’ve never ridden in one of those contraptions yet. Sure, I’ve ridden on a lot of trikes, Gary, love those, too. We had mostly jeepneys and trikes in Guimaras. Not hardly a trike in sight in Iloilo but a lot of those pedicabs. Those things are too slow, and I feel sorry for the driver hauling my fat behind around. I’m glad that your asawa was able to mend the fence. You are a good man asking for forgiveness even though you didn’t do anything wrong. I would have done the same thing. There is truth to the statement “forgive but not forget.” For me, the relationship would not be the same.